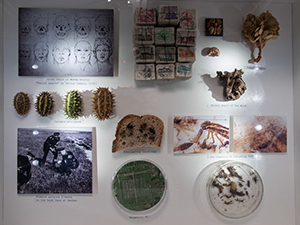 The Making, Materiality and Knowledge conference aims to provide an arena for discussions on field-specific, inter- and transdisciplinary knowledge production within the Making Disciplines/Making Professions/Making Education. The purpose of the title, The Science of Confusion, is to suggest that the room contains items and visual means that are easily associable with science, while putting in doubt the notion of science as a truth provider. 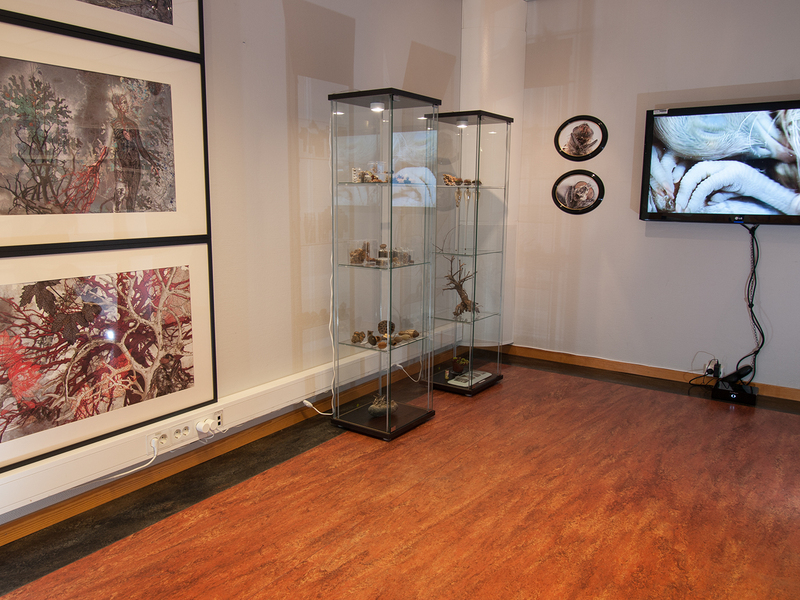 The room reflects an individual's attempt to understand, to make sense of the material world and the non-tangible inner world of thought that humans are exposed to. 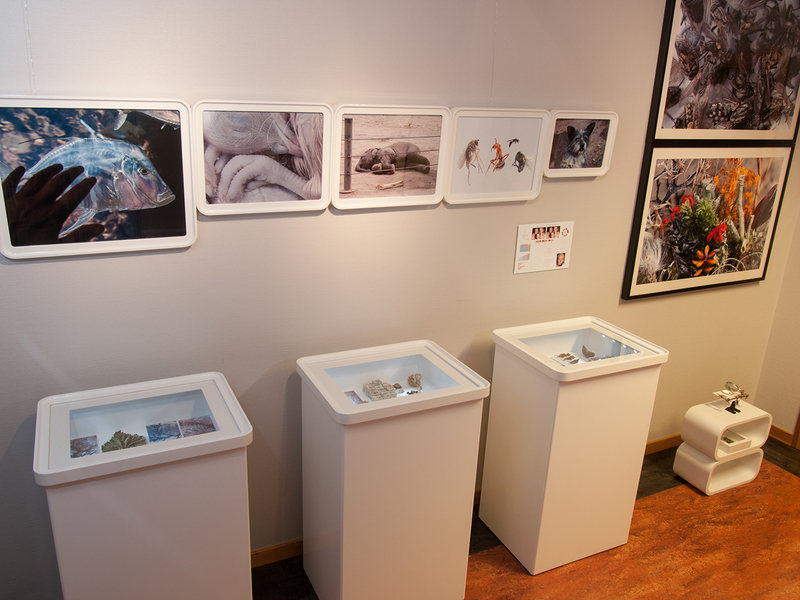 These vitrines are specially made for the exhibition. Each vitrine has a shelf under the glass and interior LED lighting. 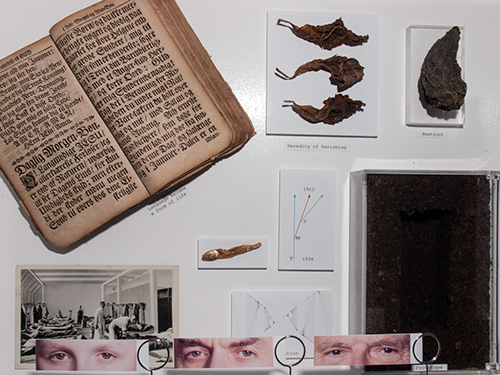 They contain a collection of objects, photographs and text. 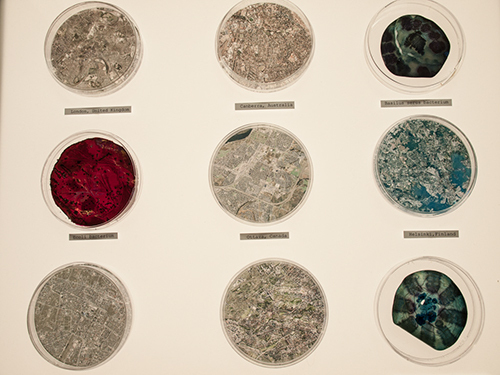 On one light box lies various satellite images of cities and dried bacterial colonies in Petri dishes. This collection is a kind of homage to nature's "hidden codes" that visually manifest as bifurcation. Bifurcation is the term denoting a division into two that happens in e.g. branches and roots of trees and plants, rivers, veins, trachea etc. 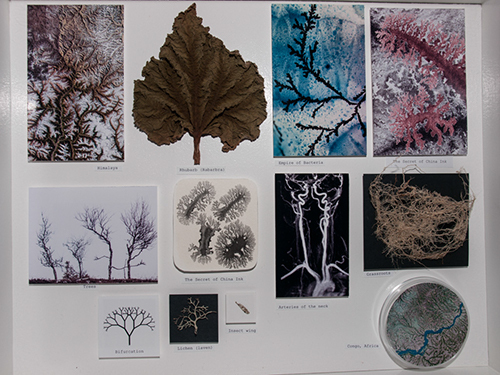 In this vitrine, from the left: a satellite picture of the Himalayas, a young rhubarb leaf that has a texture of "mountains" and "valleys", bacterial colony, macro photography of China Ink, photography of deformed mountain-trees, China Ink drawing, X-ray of neck veins, dried roots of grass, a simplified model of the bifurcation, lichen, insect wing and a river Congo in Africa in a petri dish. How China Ink forms branching forms is recorded in macro-video and in the video titled: “The Secret of China Ink” shown in the exhibition. You can see it here. Here is video which shows branches of bacterial colony. This collection includes: A copy picture of Peter Camper’s drawing "Facial Angle" from 1770, (a non-ideological drawing from a lecture given to art students about the beauty and portrait). Later, the picture was interpreted in ideological terms and used in connection with eugenics, beauty ideal and Nazi racism (Aryan race). Under the picture there are four fruits Cucumis Africanus, systematized by size. Bigger = better - classification after look. Further, there is a collection of stamps. I inherited these stamps from my father. The stamps are systematized in small packages and fastened with thin thread. It is my father who packed them in this way. To collect and care for things is something I see as one of the post-war "syndromes", but stamps also remind me of the collections of assets of prisoners in concentration camps. For example, in Auschwitz, there is a room with a "mountain" of shoes, "a mountain" of suitcases, and “a mountain" of human hair. My father spent four years in a concentration camp during World War II. Further to the right there are a number of natural forms that resemble the heart (a fragment from tree roots), brain (walnut and pumpkin seeds). There are also a heart and brain: the Cartesian dilemma of duality. 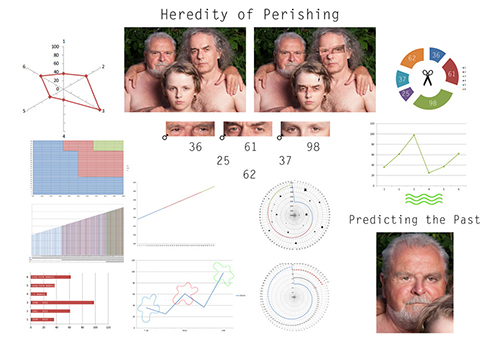 "Heredity of Perishing" - is the title of this vitrine. As the a plaque under it makes clear, this is dedicated to pseudo-research in family genetics. This is semi-research dedicated to my family . I have observed that my father in law, my husband and my son has the same type of eyes. By replacing father in law eyes with my son’s eyes, I could go back in time and infer how my father in law eyes looked like for 65 years ago, when he was 14. The poster I do not show on the web I call "Predicting the Past." Top left, there is Christian pray book from approx. 1800s. There is an text under the book: "The Language Became a Form of Life". This composition is my materialized reflection on power, place, and control that language possesses. At the same time, the book and its words undergo a process of perishing as all matter does. To the right, there are three dried leaves. I admire how the decaying process transforms leaves to architectural forms. Although all leaves come from the same tree, they form different visual forms of decay. Besides these, there is an old wrinkled beetroot. There is a postcard from 1937, from the sanatorium Piestany in Slovakia which is a place for “prolonging lives." The transparent box in the bottom right corner is filled with soil. In the middle of the soil there is a rectangular hollow shape (hole) as a reminder of an empty tomb, it's called "Prototype". 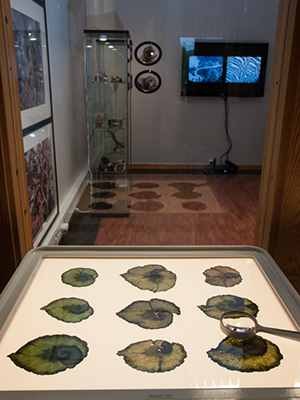 In one of the light boxes behind the glass-plate lies thin dry Begonia Rex Escargot leaves. The public can study internal structures of the begonia through the magnifying glass.